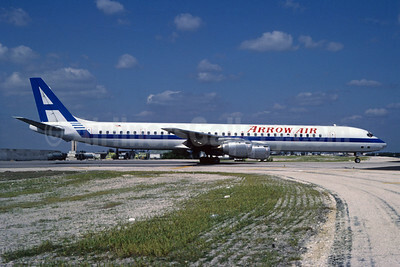 (Arrow Airways) (JW/APW) (Miami) 1981 - 2002. Photos. Framable Color Prints and Posters. Digital Sharp Images. Aviation Gifts. Slide Shows. 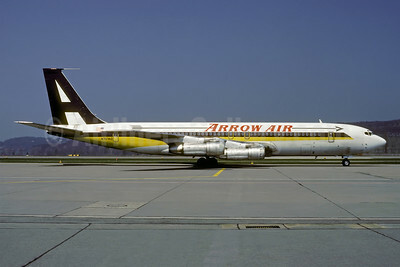 Arrow Air (2nd) Boeing 707-327C N707AD (msn 19529) (Singapore Airlines colors) ZRH (Rolf Wallner). Image: 926614. 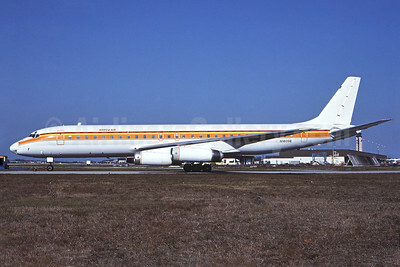 Arrow Air (2nd) Boeing 707-338C N707GB (msn 18808) (Singapore Airlines colors) MIA (Bruce Drum). Image: 102561. 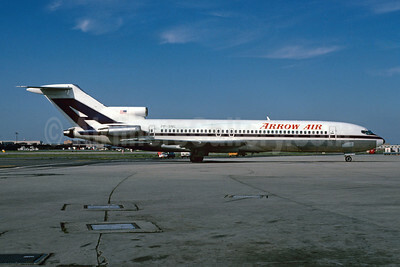 Arrow Air (2nd) Boeing 727-214 N409BN (msn 20162) (Pride Air colors) MIA (Bruce Drum). Image: 103210. 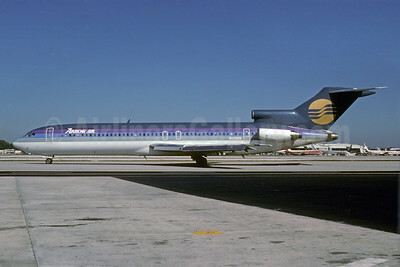 Arrow Air (2nd) Lockheed L-1011-385-1-15 TriStar 200 (F) N306GB (msn 1138) MIA (Bruce Drum). Image: 102562. 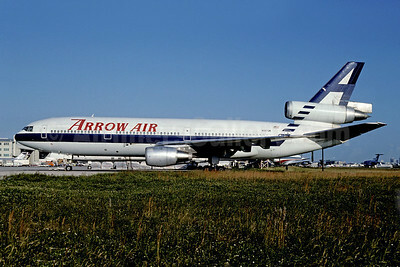 Arrow Air (2nd) Lockheed L-1011-385-1-15 TriStar 200 (F) N307GB (msn 1131) (Fine Air colors) MIA (Bruce Drum). Image: 102563. 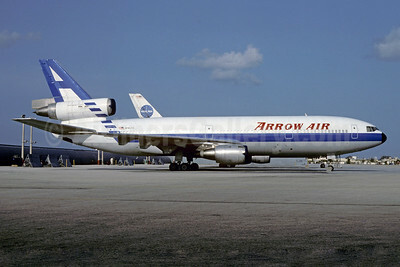 Arrow Air (2nd) Lockheed L-1011-385-1-15 TriStar 200 (F) N307GB (msn 1131) MIA (Jay Selman). Image 403030. 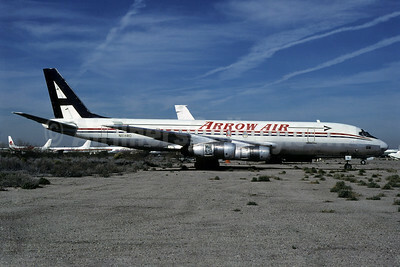 Arrow Air (2nd) Lockheed L-1011-385-1-15 TriStar 200 (F) N308GB (msn 1133) MIA (Bruce Drum). 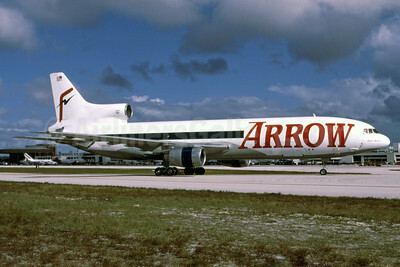 Image: 104277..
Arrow Air (2nd) McDonnell Douglas DC-8-61 (F) N29UA (msn 26159) (Fine Air colors) MIA (Bruce Drum). Image: 102564. 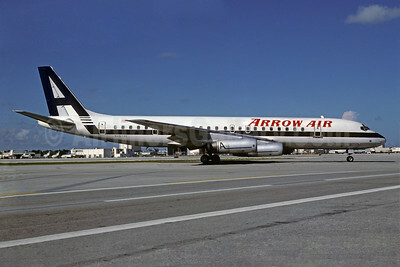 Arrow Air (2nd) McDonnell Douglas DC-8-62 (F) N8969U (msn 46070) MIA (Bruce Drum). Image: 103209. 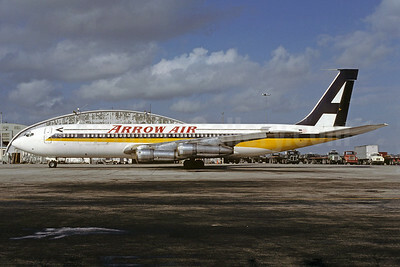 Arrow Air (2nd) McDonnell Douglas DC-8-62 N1809E (msn 46107) (Surinam Airways colors) MIA (Bruce Drum). Image: 102425. 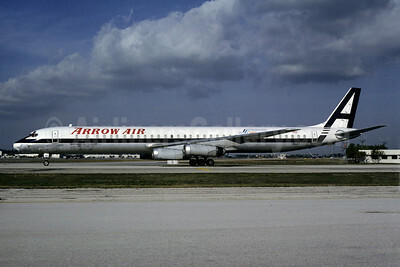 Arrow Air (2nd) McDonnell Douglas DC-8-62 N8973U (msn 46085) MIA (Bruce Drum). Image: 102568. 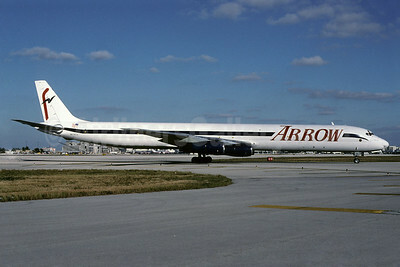 Arrow Air (2nd) McDonnell Douglas DC-8-62 N8974U (msn 46110) (United Airlines colors) MCO (Keith Armes). Image; 909563. 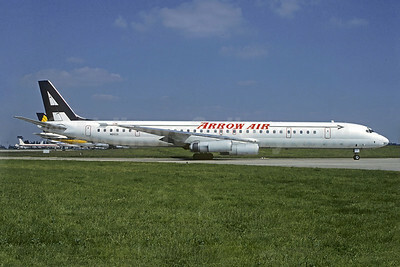 Arrow Air (2nd) McDonnell Douglas DC-8-63 (F) N345JW (msn 46042) (red arrows) MIA (Bruce Drum). Image: 102565. 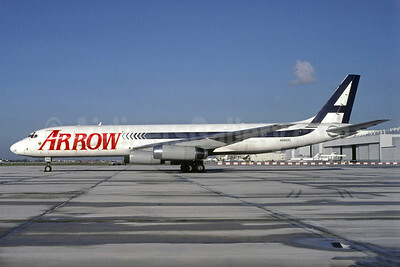 Arrow Air (2nd) McDonnell Douglas DC-8-63 (F) N441J (msn 45988) MIA (Bruce Drum). Image: 102571. 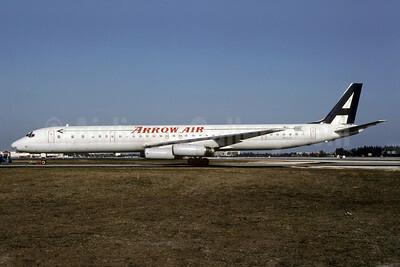 Arrow Air (2nd) McDonnell Douglas DC-8-63CF N6162A (msn 46061) MIA (Bruce Drum). Image: 102569. 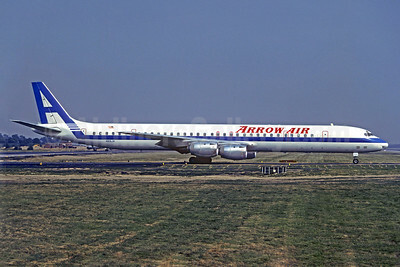 Arrow Air (2nd) McDonnell Douglas DC-8-63CF N6162A (msn 46061) ORY (Christian Volpati Collection). Image: 920177. 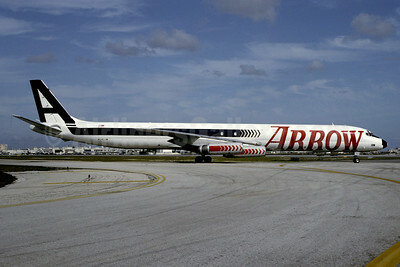 Arrow Air (2nd) McDonnell Douglas DC-8-73CF N919CL (msn 46106) MIA (Bruce Drum). Image: 102570. 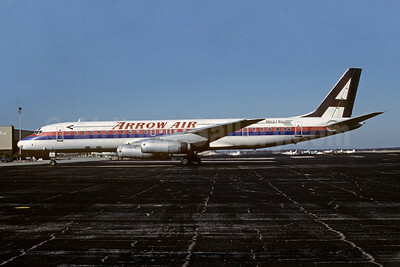 Arrow Air (2nd) McDonnell Douglas DC-8-73CF N919JW (msn 46106) LGW (Christian Volpati Collection). Image: 920178. 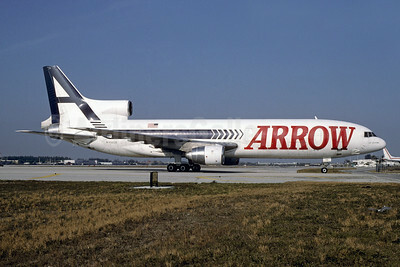 Arrow Air (2nd) McDonnell Douglas DC-8F-54 N108RD (msn 45663) (Airlift International colors) MZJ (Thomas Livesey). Image: 909562. 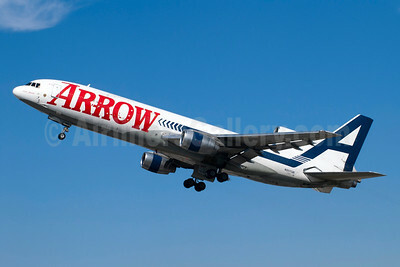 Arrow Air (2nd) McDonnell Douglas DC-10-10 N902CL (msn 46905) MIA (Bruce Drum). Image: 102566. 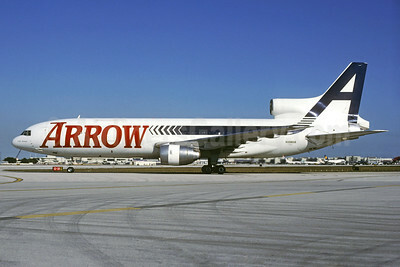 Arrow Air (2nd) McDonnell Douglas DC-10-10 N917JW (msn 46727) MIA (Bruce Drum). Image: 102567.